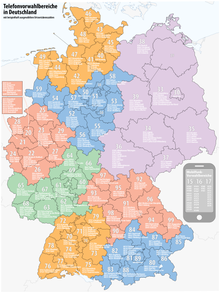 Area codes in Germany (German: Vorwahl) for telephones have two to five digits, not counting the first zero. The first or "leading" zero must be dialled when calling from inside Germany and not when calling from outside Germany. The area code is not needed when dialling another telephone in the same area, unless one of the telephones is a mobile phone. Usually shorter area codes are used by larger cities, and longer area codes to smaller towns. (0)1 are special numbers such as mobile phones (015, 016, 017), shared cost service (0180), televoting numbers (013) and 010 for dial-around services. The OLD codes 0130 for free phone numbers and 0190 for premium-rate numbers are now moved to 0800 and 0900 to meet international standards. This page was last changed on 30 January 2019, at 20:30.